Arizona-based inbound marketing agency, Prism Global Marketing Solutions, achieves HubSpot Platinum Partner status, joining an elite group of marketing agencies around the globe. Becoming a HubSpot Platinum Partner is a great milestone for us. Partnering with HubSpot allows us to deliver innovative, strategic & sustainable inbound marketing and sales solutions to enable our clients to grow & scale their businesses. Prism Global Marketing Solutions, an inbound marketing agency based in Phoenix, AZ, is proud to announce they have been selected as a HubSpot Platinum Certified Agency Partner. 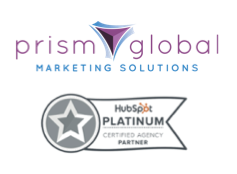 As a HubSpot Platinum Certified Agency Partner, Prism Global Marketing Solutions joins an elite group of global agencies that have received this distinction. Prism Global Marketing Solutions is honored to be one of only 68 agencies globally to reach the prestigious distinction of Platinum Partner tier status in a group of over 2,500 HubSpot agency partners worldwide. In order to earn Platinum Level status in HubSpot's Partner Program, an agency must display and meet criteria built around volume of HubSpot customers, implementation of inbound marketing and inbound sales best practices, and overall customer satisfaction and growth through inbound marketing. "I and the whole team in HubSpot are very proud and excited to welcome Prism Global Marketing Solutions as a HubSpot Platinum Partner. HubSpot recognizes Prism Global Marketing Solutions as a leading member of our partner team as they are incredible to work with. The vision and drive of Prism Global Marketing Solutions allows HubSpot to look to them as a trusted advisor. Their award winning services and focus on ROI stands out in the crowd," said HubSpot Channel Account Manager, Chris Alexis. "Becoming a HubSpot Platinum Certified Agency Partner is a great milestone for us. Partnering with HubSpot allows us to deliver innovative, strategic and sustainable inbound marketing and sales solutions to enable our clients to to grow and scale their businesses," says Elyse Meyer, Founder of Prism Global Marketing Solutions. "As we continue to grow, HubSpot will remain an integral part of our business model as we leverage HubSpot's continually growing set of inbound marketing and sales tools to drive valuable services that are truly impactful for our clients," says Elyse Meyer. HubSpot is the world’s leading inbound marketing and sales platform. Since 2006, HubSpot has been on a mission to make the world more inbound. Today, over 16,000 customers in more than 90 countries use HubSpot’s software, services, and support to transform the way they attract, engage, and delight customers. HubSpot’s inbound marketing software, ranked #1 in customer satisfaction by VentureBeat and G2Crowd, includes social media publishing and monitoring, blogging, SEO, website content management, email marketing, marketing automation, and reporting and analytics, all in one integrated platform. HubSpot Sales, HubSpot’s award-winning sales application, enables sales and service teams to have more effective conversations with leads, prospects, and customers. HubSpot is headquartered in Cambridge, MA and has offices in Dublin, Ireland, Sydney, Australia, Singapore, and Portsmouth, NH.